1075 Samar Road, Cocoa Beach, FL.| MLS# 842257 | Free Brevard County MLS Home Search. No Agent Needed. Daily Auto-Email Listings of All Brevard County Homes and Listings For Sale That Meets Your Home Buying Criteria. Brevard County Real Estate Market Information. 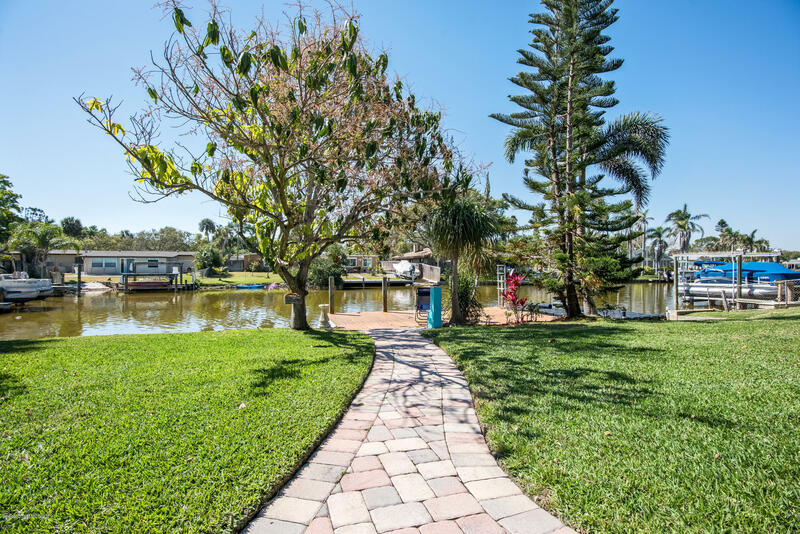 Living DIRECTLY ON THE CANAL means you walk right out to your boat, or carry your pole to catch some fish while watching dolphins glide by. You'll appreciate having a seawall & fixed dock PLUS you're only a couple of minutes to the main river! Plenty of room to add a pool too if you want one! Covered Patio is great for entertaining plus you can turn on the Florida Keystone FIREPLACE for ambiance. Oversized Family/Florida room will provide hours of relaxation with great views of the water. 3 bedrooms with Master Suite featuring an updated bath & walk in closet. You'll love the upgraded stainless appliances & NEW refrigerator along with built in desk. You also have a Sauna or Hot Tub to enjoy after a long day. You'll want to come home to this beautiful well landscaped beauty!